Hello Everyone and Thank You!!!!!! We just had our fiftieth chemo cap dropped off! YEAH EVERYONE! Thank you! Thank you! Thank you! Thank you! We will be dropping these caps off to a local hospital sometime next week. We will also be scheduling our next Knit for Comfort in our shop for sometime in mid to late June - stay posted for an upcoming date. 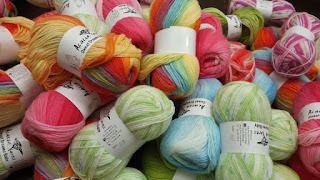 The Yarn and Fiber Company will also be vending at the Granite State Knit-In XVI which is a wonderful event happening on June 2 from 8:30 - 5:00 at the Governor Adams Lodge at Loon Mountain. We are so excited! (For details, call 603-898-6931.) This will be our first venue and we are brainstorming about what to bring! Woo hoo! Good things are on the horizon.... I can't wait to confirm more of them so I can let you all in on the fun! Oh, wait, another event! We will also be vending at The Knitting and Crochet Show in Manchester NH this July 13-15th at the Radisson Center. We will be located in booth #318 and again we are very excited about this event! We are busy emailing with designers to secure a great line-up for all of you who are interested in meeting or workshoping with our wonderful designers who inspire us in all things we love! If you have any designers in particular that you would like to meet, please let us know and we will add them to our list for contacting! Cross your fingers and wish us luck - if they all say yes this upcoming Summer, Fall and Winter will be fantastic. PS - Don't forget, we have Cheryl Potter returning to our shop to do another workshop on September 15 from 1-4 - we still have a few more spots availalbe so either email us (sales@yarnandfiber.com) or call us (603-898-5059) to reserve your spot! This workshop is limited to 20 wonderful people!